If you focus on the name, you lose the substance. "The name that can be named is not the eternal Name. The unnamable is the eternally real," said Lao Tzu. So can Love be defined? No, if we live it. And yes, for all other purposes. 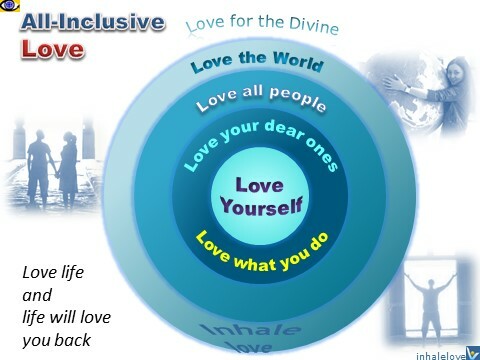 Loving yourself is at the core of your loving relationships with your life, with others and the World. Don’t be hard on yourself, give up negative self-talk. Know just how unique, talented, fabulous, powerful you are. “As I began to love myself I freed myself of anything that is no good for my health – food, people, things, situations, and everything the drew me down and away from myself. At first I called this attitude a healthy egoism. Today I know it is LOVE OF ONESELF’,” said Charlie Chaplin. Love and knowledge are two important things in the world – when we share them their values don't decrease, they always increase. Love breeds love. Love others if you want to understand them and build loving relationships. The more you truly care, the more you come to know not only other people, but also yourself thus unlocking your true potential. When you love others you don't focus on negative things, you focus on how to make people feel happier. In this quest, you keep growing mightier and happier and create increasingly great value for others. We were born to love, and do what we love to do. If you love what you do, there are no difficult tasks, only interesting ones. Love is the energy of your life and your behavior towards others. Enjoy every moment of your life and love every person you meet. 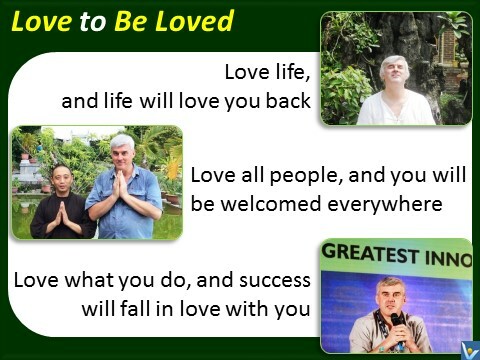 To achieve true happiness, open your heart to love: love what you have, love what you do, love other people. takes the first step towards real love. Love is your Life and Happiness boat in the predaceous sea of Sin and Unhappiness. The bigger your love, the bigger your boat. Neither intelligence nor imagination nor both together go to the making of genius. Love, love, love, that is the soul of genius. Rivers flow into the sea, but there is one that flows out ‒ it's the River of Joy flowing out of the Sea of Love.